Newly refurbished NCL Jewel is a great ship, aside from the cabin&apos;s bathroom, the whole ship feels really new and fresh, doesn&apos;t seem like a 13 year old ship at all. Service and dining was nothing impressive, but it wasn&apos;t too bad. Entertainment was some of the best I have ever seen! Embarkation was pretty average, nothing like the smooth and amazing experience I had on RCI but it was okay. Lines were long but without assigned boarding times, that&apos;s what you should be expecting. It was annoying they didn&apos;t have a hole punched in the cruise card and we had to go to guest service to get it punched. All the public spaces look pretty much new, no complain there at all. The decor was very much to my liking, the Jewel is a beautiful ship. Some passageways is a touch too narrow for my liking especially after evening shows, but it wasn&apos;t terrible. There is enough seating everywhere around the ship so that&apos;s excellent. Dining was so so at the start but improved over the cruise, maybe I got better luck later on and made better choices? Had a few really really good dishes that I actually ordered another plate of it. The buffet doesn&apos;t have a ton of differences throughout the whole cruise. All the food is very american, depending on your taste that might or might not be a bad thing. Entertainment, shows and activities were all great. Sadly none of the poolside activities ended up happening because of the weather, but the other activities were excellent. The evening production shows were amount the best I have seen. Very impressive with them, but the non-production show like the "magic" show and music show were underwhelming, I recommend skipping them. Service were fine. Didn&apos;t feel like anyone tried very hard but they all did their job reasonably well. Overall it was a nice cruise, wasn&apos;t blown away, but it was nice enough for me to consider NCL again. 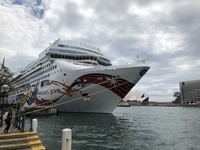 Newly refurbished NCL Jewel is a great ship, aside from the cabin&apos;s bathroom, the whole ship feels really new and fresh, doesn&apos;t seem like a 13 year old ship at all. Service and dining was nothing impressive, but it wasn&apos;t too bad. Entertainment was some of the best I have ever seen! Embarkation was pretty average, nothing like the smooth and amazing experience I had on RCI but it was okay. Lines were long but without assigned boarding times, that&apos;s what you should be expecting. It was annoying they didn&apos;t have a hole punched in the cruise card and we had to go to guest service to get it punched. All the public spaces look pretty much new, no complain there at all. 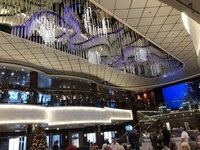 The decor was very much to my liking, the Jewel is a beautiful ship. Some passageways is a touch too narrow for my liking especially after evening shows, but it wasn&apos;t terrible. There is enough seating everywhere around the ship so that&apos;s excellent. Dining was so so at the start but improved over the cruise, maybe I got better luck later on and made better choices? Had a few really really good dishes that I actually ordered another plate of it. The buffet doesn&apos;t have a ton of differences throughout the whole cruise. All the food is very american, depending on your taste that might or might not be a bad thing. Entertainment, shows and activities were all great. Sadly none of the poolside activities ended up happening because of the weather, but the other activities were excellent. The evening production shows were amount the best I have seen. Very impressive with them, but the non-production show like the "magic" show and music show were underwhelming, I recommend skipping them. Service were fine. Didn&apos;t feel like anyone tried very hard but they all did their job reasonably well. Overall it was a nice cruise, wasn&apos;t blown away, but it was nice enough for me to consider NCL again. New addition in the cabin were great, USB ports and new TV is nice. The rest of the decor in the cabin was an older design, but wasn&apos;t too dated. The TV being all the way next to the balcony door is not great for viewing from bed and the TV is a bit small by today&apos;s standard. Bathroom with door separating the bath from the basin from the toilet was interesting. The doors were too see through for any privacy, so if you were going to the in the bathroom at the same time, you need to be comfortable enough already so I am really not too sure what the purpose of the door were, just made the bathroom feels smaller than it is. Curtain dividing the bed from the sofa is amazing if you have 3 people in the room, extra nice that bed side of the room and sofa side have seperate aircon. Balcony is perfectly sized, enough for 3-4 people to be comfortable on it without wasting space. Balcony furniture can be a lot better though, the two chairs on the balcony cannot be reclined, there is definitely enough space for it a bit disappointed here. Cabins in front of 11592 and 11092 have the deck above extended out around 1-2 m further than the balcony, which mean you won&apos;t get any sun at all but shelter you from rain. Cabins aft of those cabins is the opposite and the deck above is around 0.5 m behind the balcony, so you can get a lot of sun. All the balcony dividers are 10-20 cm too short, so when you stand at the edge of your balcony you can see all the way up and down all the balconies, it also give you and everyone else very good angle to see into the balconies around them. So don&apos;t expect privacy on the balcony.